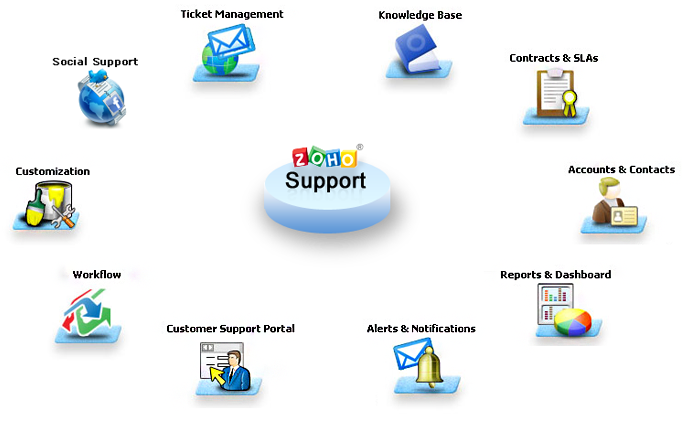 A Web based Help Desk Software, Zoho Support helps to manage easily a high volume of tickets as well as customize the entire request page fields and layout according to one’s requirements. It also enables agents to keep record on most of the important details with regards to customer interactions as well as trace the most relevant solutions with ease. It can convert queries automatically when submitted by customers via their web forms wherein customers can assign the request for immediate response enabling customer usage on customer portal. Moreover it also provides a choice of creating one’s own different views based on suitability as well as the need for any customer support. The internal communication is effectively managed with the `comments’ features available which gives comprehensive instructions to agents who help in serving the customers in an efficient manner. With the help of Zoho Support, the online help desk software users can receive mails twenty four hours a day without any dropouts from web as well as email. The convenient use of integrated knowledge base, to navigate to any relevant search is also made available besides creating necessary field based on requirement and modify Request Module according to one’s choice. It can also manage huge traffic, receive a large number of mails in the inbox and customize and work on Request Module based on the organization convenience and requisite. Besides all these facilities provided, Zoho Support also offers add-ons as well as different integrated choices to enable their users to improve their efficiency while working on support request.